SILVER AWARD WINNER! 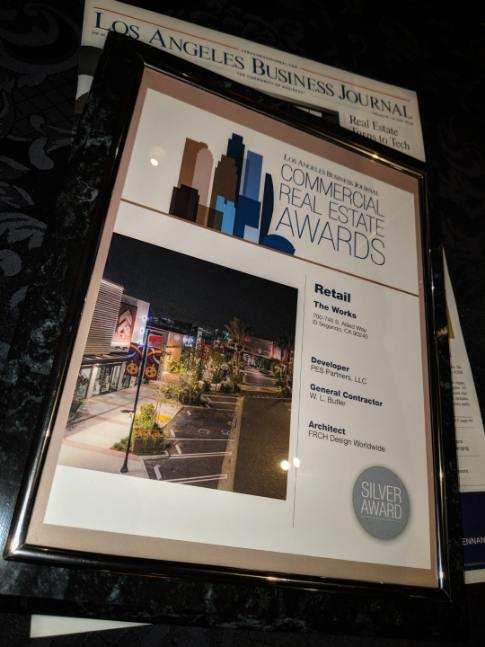 The Los Angeles Business Journal awarded The Works @ Plaza El Segundo second place honors for Best Retail Project in the county. The expansive facade upgrade included installation of new hardscape, trees and communal gathering spaces with a trellis, seating fire pit and planters. 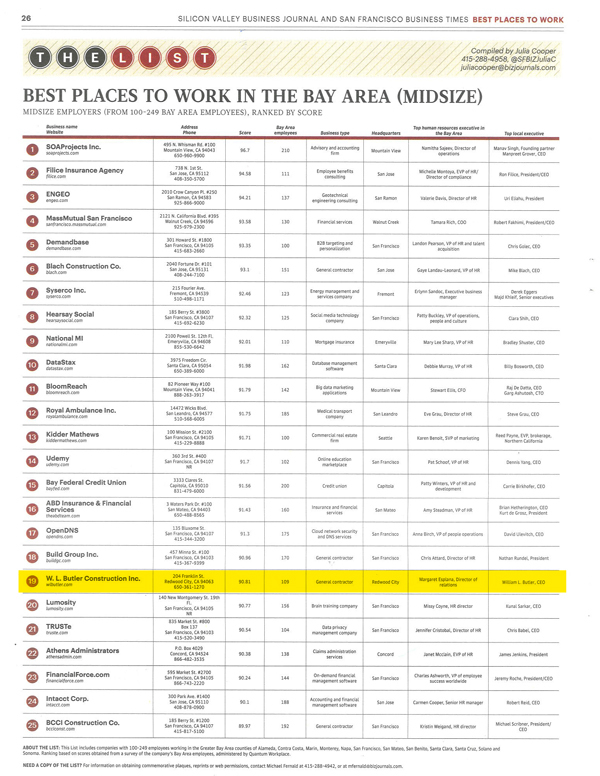 TOP 50 WORK PLACE IN ORANGE COUNTY! 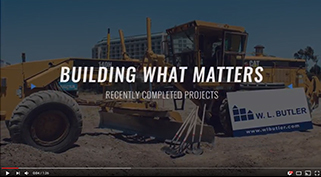 Based on employee responses to an independent questionnaire, W. L. Butler Construction, Inc. ranked #33 out of 80 companies with 99 or fewer employees in the region. GIVING BACK! Recognized once again as a Top Corporate Philanthropist by the Silicon Valley/San Jose Business Journal; the company ranked #23 among more than 50 of the region’s businesses. 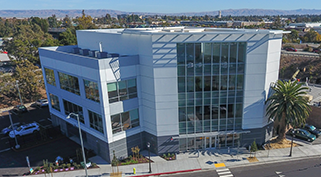 W. L. Butler is proud to be named as one of the Healthiest Employers within the Greater Bay Area.This annual awards program recognizes those companies that pro-actively shape the health of their employees; committed to making an impact on the health of their workplace and their bottom line. 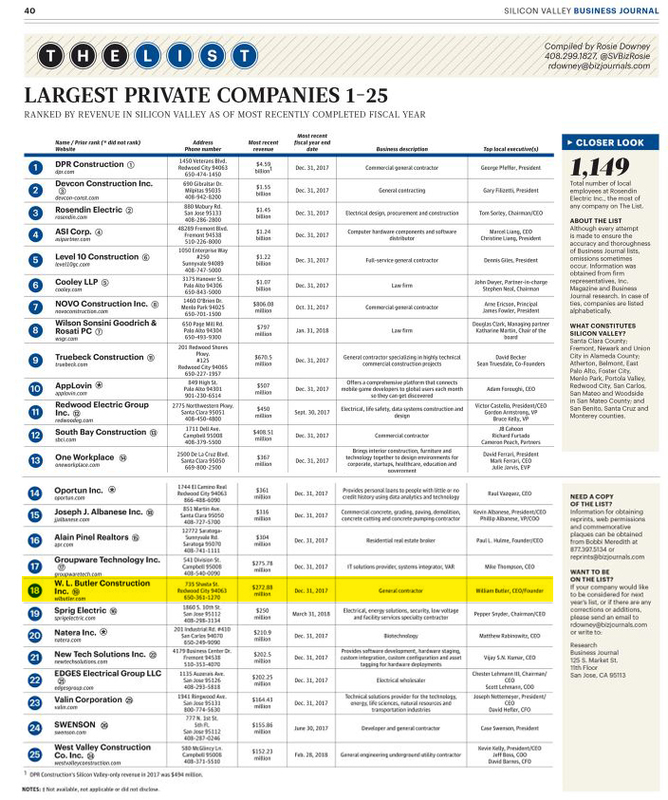 W. L. Butler named among the Largest Private Companies in the Bay Area based on revenue. GIVING BACK! 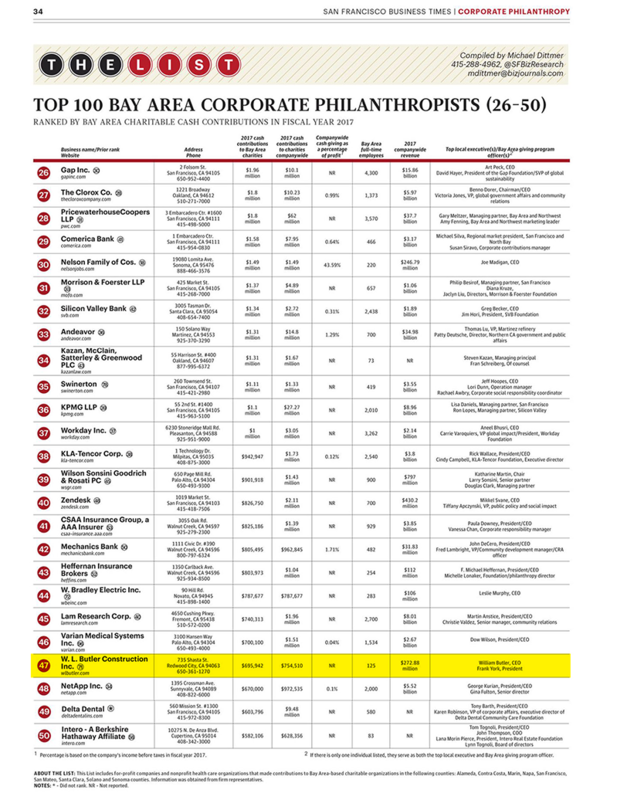 Recognized once again as a Top Corporate Philanthropist by the San Francisco Business Times; the company ranked #47 out of 100 of the region’s businesses. GOLD NUGGET AWARDS! The 2018 Gold Nugget Grand Award for Best Rehabilitation Project was presented to Downtown College Prep and Woodside Priory Stream for received an Award of Merit for Best Educational Project. The company was an Award of Merit winner in 2017, 2016, 2014, 2012 and 2011 as well, but took the Grand Award in 2010. 777 Aviation received an Award of Excellence in the landscape architecture category at the Los Angeles Business Council Architecture Awards. The design team leveraged the benefits of glass throughout the building to optimize and enhance daylight diffusion, thermal performance, and overall aesthetics. Spanning 12.5 acres, the site offers multiple congregation areas amidst a garden setting with fire pits wrap the exterior of the building. 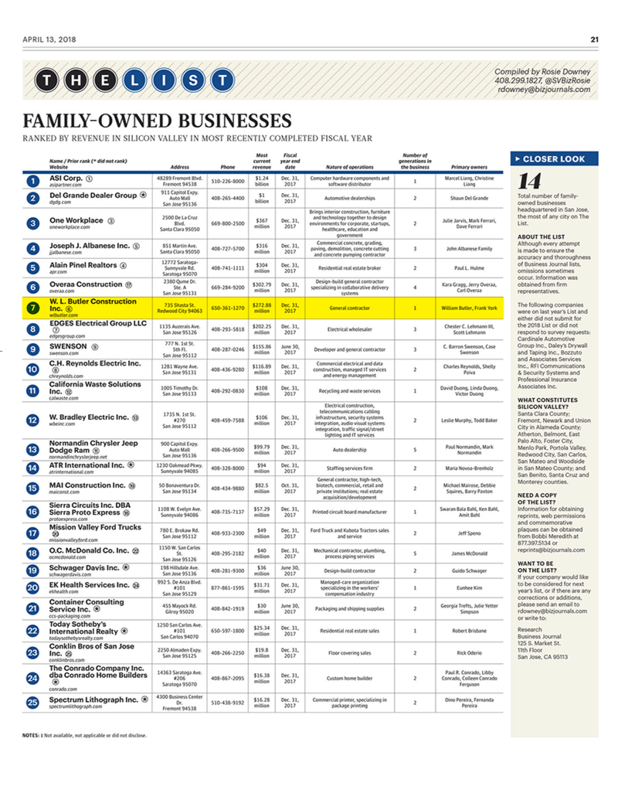 W. L. Butler named among the top 50 family-owned businesses in the Bay Area based on revenue. BEING HEALTHY MATTERS! Named as one of the Healthiest Employers in the Bay Area by the San Francisco Business Times; ranking #25 out of 35 companies with 100-499 employees for having a strong wellness program focused on employees’ physical and mental well-being. It is truly an honor to announce that we have been recognized as a Fit-Friendly Worksite by the American Heart Association’s My Heart. My Life. initiative for the third year in a row! This award recognizes worksites for making the health and wellness of their employees a top priority. 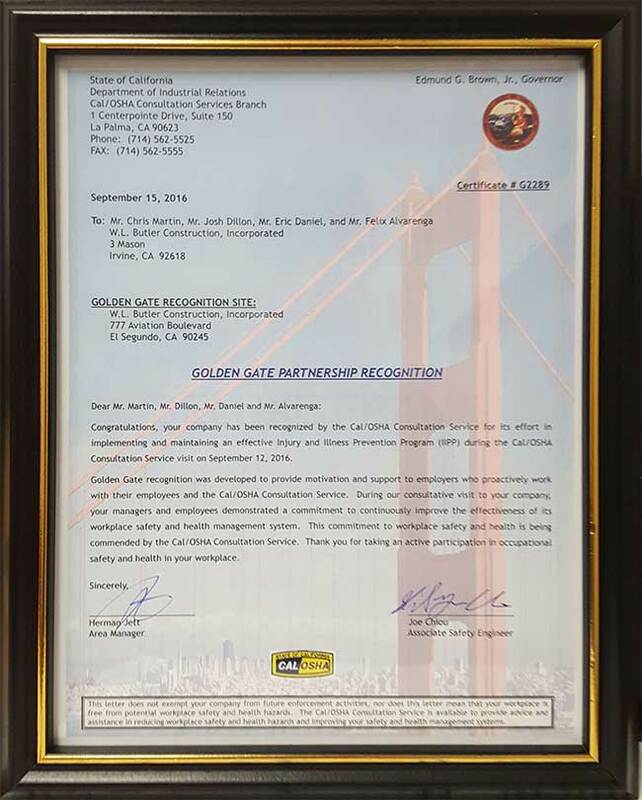 W. L. Butler has been recognized by Cal/OSHA Consultation Service for its effort in implementing and maintaining an effective Injury and Illness Prevention Program (IIPP). SILVER AWARD WINNER! The San Fernando Valley Business Journal awarded Athens Services in Sun Valley second place honors for Best Redevelopment Project in the county. The ground-up materials recovery facility is the first of its kind in the Los Angeles area; equipped with a solar powered collection system and the ability to sort/process food-waste. GOLD AWARD WINNER! 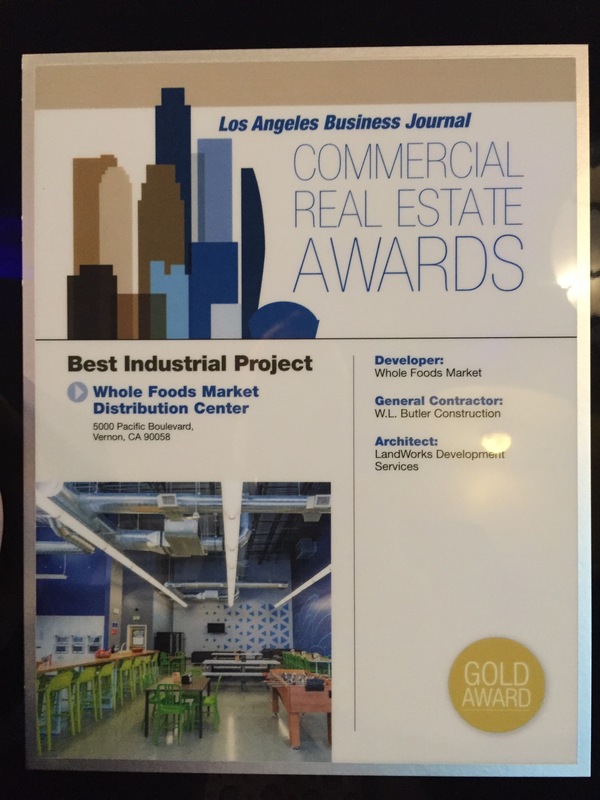 The Los Angeles Business Journal awarded Whole Foods Vernon first place honors for Best Industrial Project in the county. Two of the three existing buildings on a 9.8 acre property were demolished and replaced with a new 128,000 square foot Green Globes certified building. SILVER AWARD WINNER! 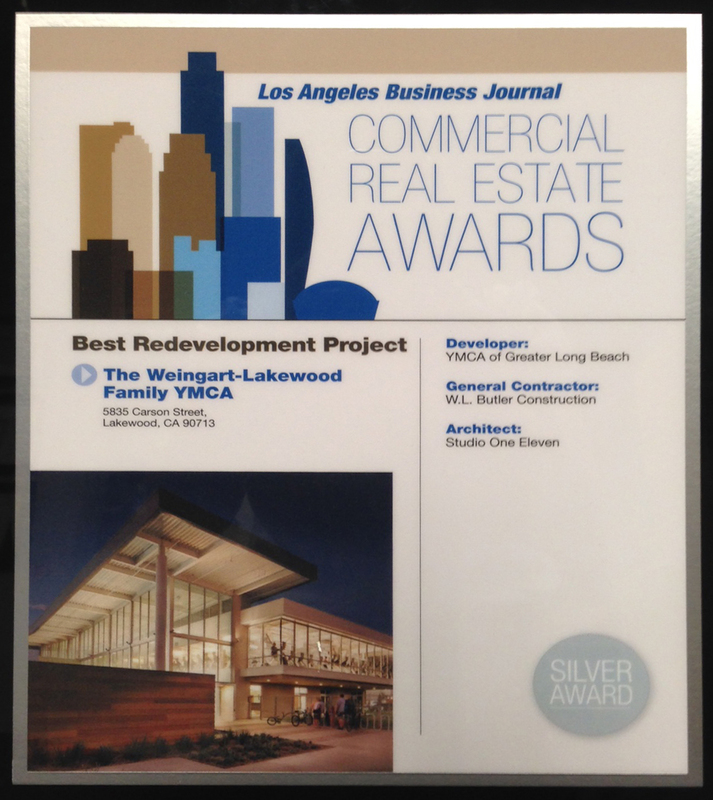 The Los Angeles Business Journal awarded Weingart-Lakewood Family YMCA second place honors for Best Redevelopment Project in the county. This was an extensive 34,382 square foot expansion and makeover of an existing fitness center. BEST PLACE TO WORK! W. L. Butler was named as one of the Top 25 “Best Places to Work” by the San Francisco Business Times and Silicon Valley Business Journal. At an awards ceremony tonight, we ranked #19 in the mid-size category with 101-249 employees. Results were tabulated by independent research firm, Quantum Workplace. GOLD AWARD WINNER! 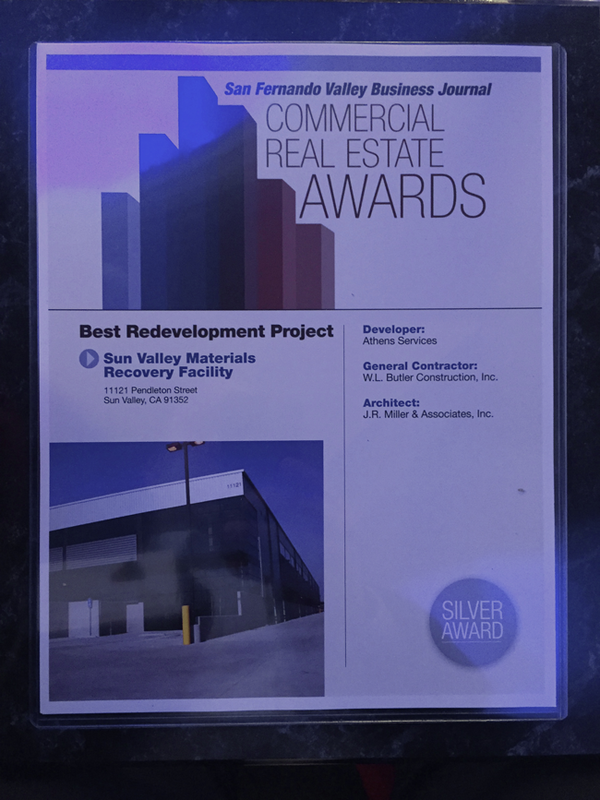 W. L. Butler Construction, Inc. received the top honor for Athens Services in the Best Industrial Project Category at the 2015 Commercial Real Estate Awards, hosted by The San Fernando Valley Business Journal. 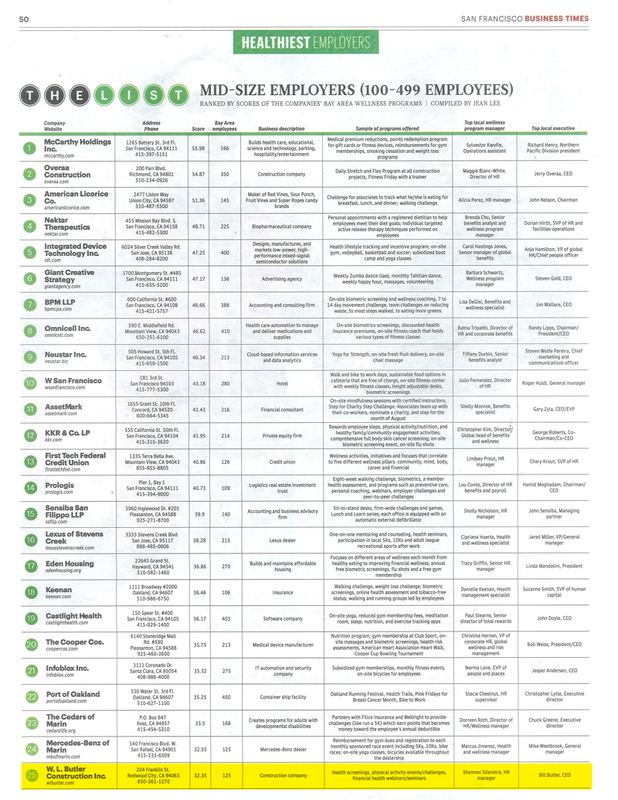 Evidence of the market’s recovery can be seen in 2014’s ENR Top 400 Contractors list. W. L. Butler ranked #334 (up from #342 the previous year). GOLD AWARD WINNER! 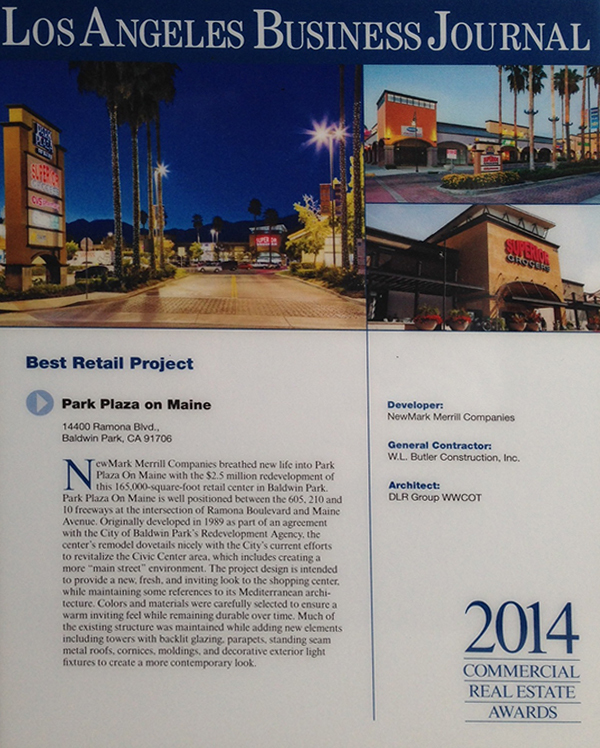 The Los Angeles Business Journal awarded Park Plaza on Maine in Baldwin Park first place honors for Best Retail Project in the county. 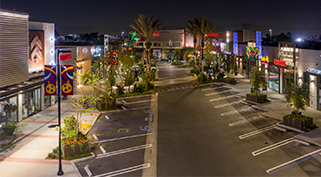 The shopping center received a complete facade and site upgrades.